14k Gold Diamond wedding band. Diamonds total .15ctw in the ladies band and are channel set. Wedding band measures 7mm wide. Diamonds in the gent's ring total .34ct tw. Ladies stock size 7, gent's 11. Captivating 14k gold two tone diamond wedding band. Diamonds total .05ct tw and in this unique wedding band design. Diamond wedding band measures 6mm in width and is available in a ladies size 7 or gent's 11. In the ladies size this ring weighs 7.86grams. Dramatic 14k gold two tone diamond wedding band. Diamonds total 1/3ct tw and are channel set in white gold along one side of this ring. Diamond wedding band measures 6mm in width and is available in a ladies size 7 or gent's 11. In the ladies size this ring weighs 6.78grams, in the men's size ring weighs 7.37grams. Tantalizing 14k two tone blended gold diamond wedding band set. 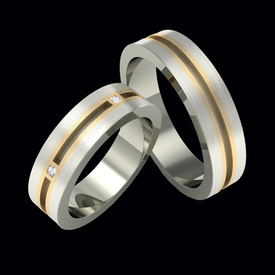 Our price shown is for the matching pair of wedding bands, set with .30ct tw SI 1 clarity G-H color diamonds. 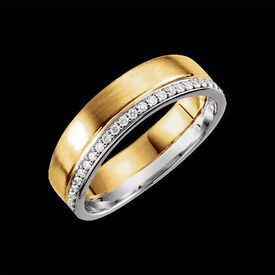 This beautiful design measures 6.5mm wide for the ladies diamond band and 5.5mm wide for the matching gent's wedding band. This custom made wedding band set is available in a polished or brushed finish and available in a variety of combinations. Because our expert craftsmen make this to order it's made special just for you. Custom made to order and available in 14k yellow, 14k white, 14k rose, 18k golds, or Platinum. Use our request email for 18k and platinum pricing. Sophisticated 14k two tone gold diamond wedding band set. 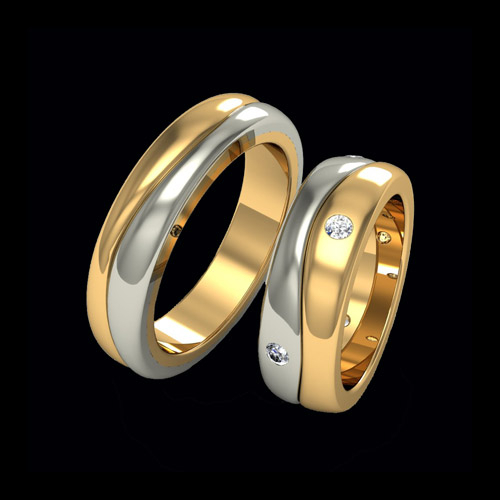 Our price shown is for the matching pair of wedding bands, white gold with yellow gold accents, set with .30ct tw SI 1 clarity G-H color diamonds. This beautiful design measures 6mm wide and is shown with the brushed finish. 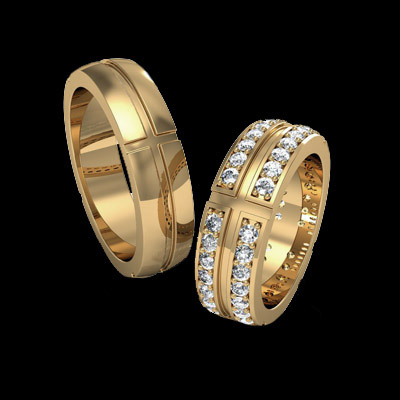 This wedding band set is a timeles design and created in the United States with superior quality. Ring set is Custom made to order and available in 14k yellow, 14k white, 14k rose, 18k golds, or Platinum. Use our request email for 18k and platinum pricing. 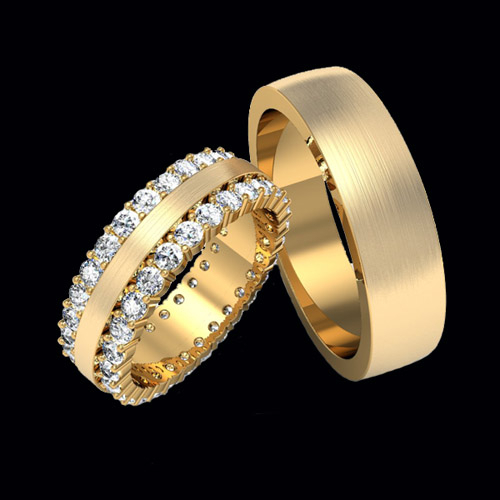 Captivating 14k Gold diamond wedding band set. Our price shown is for the matching pair of wedding band complete with 1.74ct tw SI 1 clarity G-H color diamonds. This beautiful design measures 6mm wide and is shown with the brushed finish. 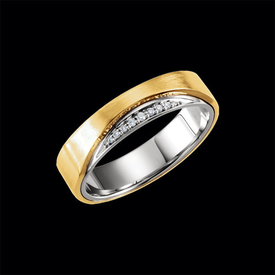 This wedding band set is finely crafted, an incredible design. Prices may increase for ladies size over 9 due to the additional diamonds. Rings are custom made in the United States and unique in there design. Custom order this ring in 14k yellow, 14k white, 14k rose, 18k golds, or Platinum. Use our request email for 18k and platinum pricing. 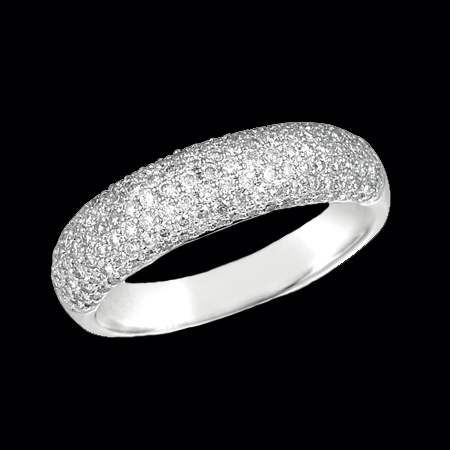 Lovely 14k White gold Pave diamond band. This diamond band is an elegant favorite, wear it as your wedding band or just because you love the dazzling look of pave diamonds. Diamonds are SI 1 clarity G color and total .77ct tw in this design. Diamond ring design is slightly domed in design and measures about 4mm in width. 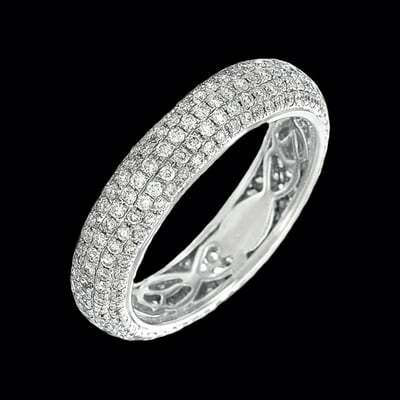 There are 127 diamonds in this 14k white gold pave diamond band. Diamonds cover over 3/4 in this ring style. We have many lovely Pave diamond rings. 14k White gold Pave diamond band. 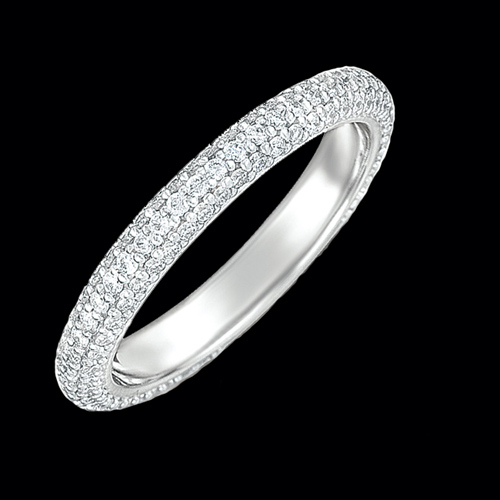 This diamond band is simply gorgeous, wear it as your wedding band or just because you love the dazzling look of pave diamonds. Diamonds are SI 1 clarity G color and total .80ct tw in this design. Diamond ring design is domed in design and measures about 6mm in width. We have many lovely Pave diamond rings. Tri Square diamond wedding band. Captivating wedding band is shown in a 14k white gold that measures 7mm in width. This great design features 3 princess cut diamonds each with a diagonal line on either side. Diamonds total .21ct tw with the center diamond a little larger then either side stone. Edge of this band is beveled and polished, a nice accent to the satin band. This wedding band is part of our custom made to order collection and is available in 14k yellow gold, rose gold, white gold, or a combination. Also 18k yellow, rose, white, combination, and the luxury choice, Platinum 950. Custom width also available. Any size available at no additional cost. Custom made items are non returnable but, allow us to give you, our customer, your perfect ring. It's simple, your buying the ring, you decide how it should look. Wonderful 14k gold raised center diamond wedding band. Wedding band is set with .24ct tw diamond set top, bottom, left, and right. The raised portion of this ring features a brushed finish, the polished border adds the perfect finishing touch to this ring. This diamond wedding band is part of our custom made to order collection and is available in 14k yellow gold, rose gold, white gold, or a combination. Also 18k yellow, rose, white, combination, and the luxury choice, Platinum 950. Custom width also available. Any size available at no additional cost. Custom made items are non returnable but, allow us to give you, our customer, your perfect ring. It's simple, your buying the ring, you decide how it should look. Marvelous 14k gold diamond notched style wedding band. This band measures 8mm in width and is set with .24ct tw princes cut diamonds. A comfort fit wedding band that is available in a variety of sizes from 5-12. This ring is part of our custom made to order collection and is available in 14k yellow gold, rose gold, white gold, or a combination. Also 18k yellow, rose, white, combination, and the luxury choice, Platinum 950. Custom width also available. Any size available at no additional cost. Custom made items are non returnable but, allow us to give you, our customer, your perfect ring. It's simple, your buying the ring, you decide how it should look. 14k Gold dual groove style diamond wedding band. This comfort fit wedding band measures 6mm in width and is set This ring is part of our custom made to order collection and is available in 14k yellow gold, rose gold, white gold, or a combination. Also 18k yellow, rose, white, combination, and the luxury choice, Platinum 950. Custom width also available. Any size available at no additional cost. Custom made items are non returnable but, allow us to give you, our customer, your perfect ring. It's simple, your buying the ring, you decide how it should look. With .15ct tw baguette diamonds. Diamonds are in a single row and add a little sparkle to this simple wedding band. 14k white gold offset design diamond wedding band. This great wedding band features a unique border that ends at different points on either side. Diamonds are SI 1 clarity G-H color, channel set, and total .28ct tw. This band measures 8mm in width and available in sizes 5-12. This ring is part of our custom made to order collection and is available in 14k yellow gold, rose gold, white gold, or a combination. Also 18k yellow, rose, white, combination, and the luxury choice, Platinum 950. Custom width also available. Any size available at no additional cost. Custom made items are non returnable but, allow us to give you, our customer, your perfect ring. It's simple, your buying the ring, you decide how it should look. Fabulous squared design diamond wedding ring. Shown in 14k white gold this unique band is squared on the top and bottom. This comfort fit heavy wedding band measures 8mm wide and is shown set with .55ct tw SI 1 clarity G-H color diamonds. Design includes a round diamond on one side with a line of baguette diamonds. This ring is part of our custom made to order collection and is available in 14k yellow gold, rose gold, white gold, or a combination. Also 18k yellow, rose, white, combination, and the luxury choice, Platinum 950. Custom width also available. Any size available at no additional cost. Custom made items are non returnable but, allow us to give you, our customer, your perfect ring. It's simple, your buying the ring, you decide how it should look. 14k Gold beveled diamond wedding band. Wedding band measures 7mm in with and is uniquely set in a single row with baguette diamonds. Diamonds are SI 1 clarity G-H color and total .20ct tw. Sizes available from 5-12 no additional cost. This ring is part of our custom made to order collection and is available in 14k yellow gold, rose gold, white gold, or a combination. Also 18k yellow, rose, white, combination, and the luxury choice, Platinum 950. Custom width also available. Any size available at no additional cost. Custom made items are non returnable but, allow us to give you, our customer, your perfect ring. It's simple, your buying the ring, you decide how it should look. 14k White gold flat top design diamond wedding band. This wedding band is set with princess cut diamond across the top which is flat. Diamonds total .34ct tw, they are SI 1 clarity G-H color and there are 3 of them. Price shown is for the 7mm wide band. Wedding bands brushed and polish finish give it a sophisticated style all it's own. Stunning Classic design diamond duo wedding bands. Our price shown is for the ladies 14k Yellow gold diamond band size 6.5, gent's matching band also available. Your going to love this timeless design and our superior quality. Diamonds total 1.4 carats and are SI 1 clarity G color. Ladies diamond wedding band measures 6.5mm in width, gent's matching band is 6mm wide. These wedding bands are a nice thick comfort fit, two or three times the weight of a regualr wedding band. 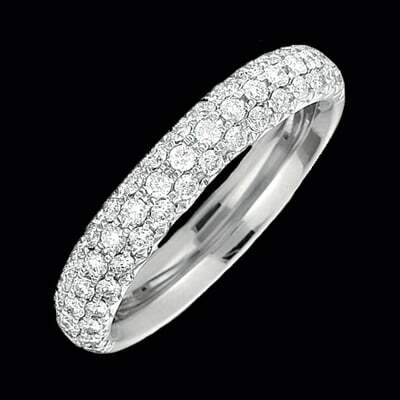 Stunning double diamond row wedding band. Our price shown is for the 14k white gold selection. This wedding band measures 7mm in width and is set with .80ct tw beautiful diamonds.